Why is Calcium Crucial for Kids? kids calcium rich recipes. Calcium is one of the most important minerals during growing phase of children. All the calcium deposition in the bones takes place during the initial years of life whereas calcium in the later part of life is used just for maintenance of the bones. Therefore, it is essential for kids to have calcium rich recipes to make their bones dense and strong. Sadly most kids are not fond of milk and refuse from drinking it. It becomes a big task for their mothers to increase their calcium intakes. Most of the mothers do not know calcium rich food items other than milk. Other Calcium rich foods include Curd, Paneer, Cheese, Ragi, Whole pulses like Bengal gram and Rajma, Amaranth Leaves, Colocasia leaves (Black and Green), Green leafy vegetables like Drumstick leaves, Fenugreek leaves, Spinach and Radish leaves, Almonds, Sesame seeds and Sunflower seeds. Try our super Almond Butter recipe. One has to be very innovative in making recipes for kids. Our section on calcium recipes for kids will relieve you from the headache of thinking innovative recipes. Kids calcium recipes should be attractive looking and packed with other nutrients too. Give your kids the calcium they need in the form of tasty dishes that they cannot refuse! 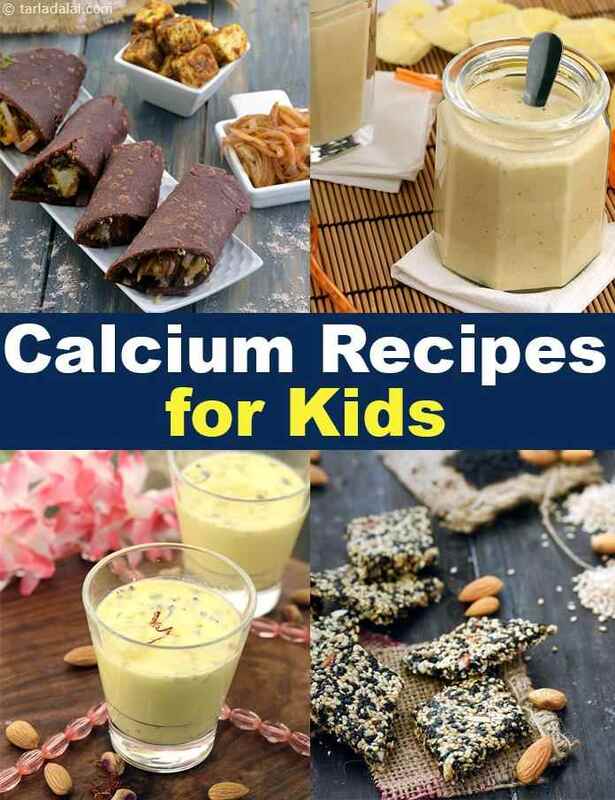 Start your kids day with healthy and calcium rich recipes from our kids calcium recipes section. Nachni Paneer Pancake will give a perfect start to your kids day. Stuffed Moong Sprouts Dosa is a really healthy alternative for the regular dosa which is also rich in folic acid. Kids would enjoy this Chocolate Peanut Butter Milkshake a rich source of Calcium, Protein, Vitamin A and Phosphorus, all of which necessary for kids growth. How about a Creamy Spinach Toast when your kid is bored of eating the same old veg sandwich for evening snacks? Kids would definitely love to devour these yummy Ragi and Broccoli Cutlets. Cheesy Pasta with Vegetables will become your kids favourite snack of all time and being loaded with vegetables it will provide the necessary vitamins too. Kids are really fussy about eating home cooked lunch. A mother really has to struggle to feed their kids at lunch. Kids only eat when the meal looks appetizing to them You can make colourful lunch recipes like Vegetable Rice with Cheese Sauce. If your child refuses to eat roti with subzis you can make wraps like Paneer and Spring Onion Wrap which look attractive to children and they won’t refuse to eat. Wondering what to give as a tiffin snack? Try giving this lip smacking Ragi Roti Stuffed with Paneer rich in Protein and Calcium which your child would definitely eat in their tiffin break. Another good option is Nachni and Onion Roti which you can give with your child’s favourite sauce, ketchup or dip. Discover many more such calcium-rich treats in this section that your kids will enjoy and you wouldn’t regret making them. Enjoy our collection of Calcium Recipes for Kids and other kids article below.